Jeremy understood the importance of investing in the next generation and, in addition to the many he mentored personally, he developed a programme for training talented UK civil servants which was competitively awarded to LSE. Each year a cohort of (hopefully) 30 new Jeremys goes through the Executive Masters in Public Policy brimming with new ideas and a commitment to the public good. It is with great sadness that we learnt of Lord Heywood’s death. Lord Heywood was a great civil servant and a good friend to LSE. The many obituaries written since his death have returned again and again to a number of attributes: his talent, his political impartiality, his sense of public service and the fact he was a grounded human being, unaffected by the importance of his position as Cabinet Secretary (from 2012) and (from 2014) Head of the Home Civil Service. He was made a member of the House of Lords when he stepped down from the civil service in late October. He had, over many years, a number of roles close to the heart of government. Tony Blair, Gordon Brown, David Cameron and Theresa May each spoke with genuine warmth and admiration about their working relationship with him. He worked with the Cabinet on challenging national issues such as the Iraq war, the 2008 banking crisis, the 2010 coalition negotiations, the 2014 Scottish independence referendum, the 2016 Brexit referendum and on subsequent negotiations. He had also been principal private secretary to Chancellor Norman Lamont at the time of Black Wednesday back in 1992. Few senior officials will have witnessed the impact of so many major events as they buffeted the machinery of government. Although occasionally criticised for being too willing to shield the Establishment, his actions were always based on a desire to follow due process and deliver the right outcome. He had been an enthusiast about improving the capability of civil servants and was a proponent of what became, following a competitive process, the ‘Civil Service and LSE Executive Master of Public Policy’ run by the School of Public Policy. He and the head of civil service policy profession, Sir Chris Wormald, have remained actively involved in the EMPP’s progress. As recently as 24 May this year, Jeremy joined LSE Director Minouche Shafik, Philip Barton, Catriona Laing and Keith Wade for an LSE Alumni event to reminisce about their time as graduate students at the School during the mid-1980s. As the invitation for the event stated, they came “back on campus [to] reconvene their 1980s LSE study group to reflect on the enduring value of an LSE education. From its small beginnings over coffee in Wright’s Bar, the group has created a special bond lasting more than 30 years”. Having chaired this event, I can report that the evening was both illuminating and fun, demonstrating the five friends’ great affection for each other. Jeremy, dealing with yet another Brexit crisis, had to rush back to Whitehall immediately after the event. Latterly, he and his successor Sir Mark Sedwill, have had to defend the civil service from attacks in relation to the UK-EU27 negotiation process. Although in 2012 he said to a select committee that “I like to be invisible”, he and his successor have had to go public in their defence of officials who were caught in the crossfire of the Brexit culture war. As Cabinet Secretary, he issued a statement to the media, arguing that the “very best people” had been deployed to make Brexit a success and that “the civil service is at its very best when under pressure”. His predecessors, Robert Armstrong, Robin Butler, Richard Wilson, Andrew Turnbull and Gus O’Donnell all remain active in the House of Lords, evidence of the remarkable moderation and continuity of British public life. 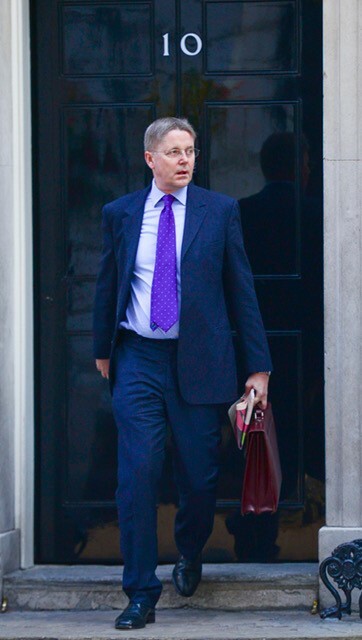 There is no doubt that Jeremy Heywood, too, would have contributed wisdom from within the Lords. His family’s loss is greatest, but his untimely death will deny us all of the benefit of his wisdom and respect for public service. Along with my civil service colleagues and alumni group members, I am deeply saddened by the passing of Lord Jeremy Heywood. Jeremy was an inspirational leader and a great mentor to me. His passion for public service knew no bounds. He always saw the bigger picture, thought radical and supported new ideas to help us prepare for and meet tomorrow’s challenges. It’s an honour and a privilege to have known and worked with Jeremy closely since I joined the civil service nearly ten years ago. Our first and lasting project was co-founding the LSE Civil Service, Government and Public Alumni Group in 2010. He is a huge loss to the country, the civil service and of course, most of all, to his family. My thoughts, prayers and condolences are with his family and friends. We must carry on with the example Jeremy set us all in his leadership, compassion and commitment to public service. Jeremy will continue to inspire me. And I will endeavour to honour his legacy and make him proud by continuing with renewed energy the projects that we started.